Try this one: I have had to obliterate not only the wording on the plaque but the detail of the "round thing", which is actually the globe. So where and what is it? Last edited by wherrygirl; November 13th, 2015, 00:34.
hmmmm....... I need to narrow down the search area a bit.... are we in South America...? that is my first thought. Not South America, but, Sigve's "or somewhere near" is very good. Are we in the Siberian steppe? The monument seems to be wing shaped.Is it a kind of air force memorial? Having spent ages studying online maps so as to define the area covered by the Siberian Steppes the best I can do is to say, yes, just about I think, Yves! But this I can be quite definite about: it is not an air force memorial of any kind. Sorry for this long,long research,Ivy.It would have been easier to explore Andorra or San Marino,I guess! Marking the Arctic Circle crossing Siberia. Somewhere on Kamchatka peninsula maybe? You are so right! Well done! Well done again, Mark. My image is here: https://commons.wikimedia.org/wiki/F...er_of_Asia.JPG It was taken in 2010, whereas the date on the Wiki one says only last November. But that monument looks as if it has been in place somewhat longer than that! It could be just the date it was uploaded. Either way, you win, so back to you. And Yves, After my studies, I am certainly now able to pinpoint where the Siberian Steppes are. I had only a very vague idea before! I did only Google 'Siberia monument' and look at the pictures - so Yves did the work really. I'll try to find something appropriate later. It seems English is more efficient than French to solve a puzzle.I googled "monuments de Sibérie" but the Ivy's picture didn't appear. As said Cecil Rhodes a century ago: What a blessing to be English! (Quel bonheur d'être Anglais). Yves, you made me double up with giggles! Google is American, after all and its French is probably like mine - schoolgirl level, though I can understand the written language without too much difficulty. Actually, after I had posted that pic. I had a horrible thought. Having explained that "the round thing is actually the globe" it dawned on me that I had probably given away a vital clue. 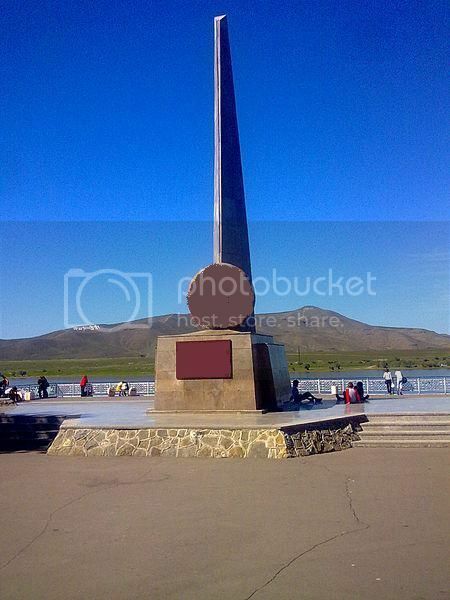 Cursing myself roundly, I promptly Googled "Obelisk globe" scrolled down a few photos and there was the one I had posted. Doomed, I decided! But no-one seemed to pick up on the globe bit, so I breathed again - just for a while. I picked up on the globe thing, hence the idea that it may have somehing to do with the Arctic Circle. Not my photo, attribution to follow when solved (10 minutes?). Ten minutes? Todays Friday - the most silent day of the forum! A few minutes of googling gave me Tianning temple. Correct? Well done Tommi - obviously too easy! 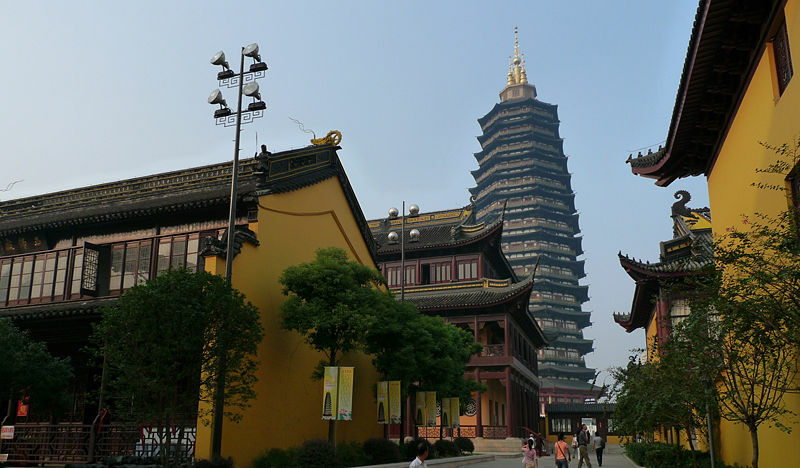 Tianning Temple in Changzhou, Jiangsu Province of China. I worked in Changzhou for a few weeks many years ago, some 'service locomotives' (used for maintaining the railway) were being built there for Singapore in the mid 1990s, and it was my job to go to the factory and check that the interface to the train protection equipment had been installed properly. It was all a bit of a shock to a young engineer who was rather used to cosmopolitan Hong Kong and Singapore rather than industrial China. Long, long time ago now.